Original 40hp NANNI DIESEL with only 502 hours on the clock. 5 batteries : 1 for the bow thruster situated under the floor of the forward cabin, 4 installed in the engine bay, 1 for the refrigerator, 1 for the engine, 2 for domestic use. Presence of 2 battery isolators. The CPC Company (previously known as RECLA) located in Digoin is the prolific constructor of the CANALOUS hire boat fleet with hundreds of hire boats in service all over Europe and of course many private examples (such as this one) which was built in 2010 to order with a number of custom features and never hired at all. Amongst the options fitted there is the aft deck canvas covers, electric toilets, bow thruster, deck shower (hot & cold water) opening windscreen and 3 burner cooker. An almost all on one level boat for ease of movement and conviviality with a protected aft deck entering directly into the saloon with its dinette to port, galley to starboard with helm forward. The saloon is bright with excellent views from deep windows and almost 2m headroom increases the feeling of space. The opening forward screen and large aft doors ensure good ventilation. Forward from the saloon is the day heads and three cabins and another shower & WC. All toilets are electric. Forward cabin has one double 140 x 190. Second cabin has a double 140 x 190 and the other is an occasional berth with simple curtain . Headroom in forward cabin is 182 and in the other forward areas 192. TRITON 1050 for sale in France. 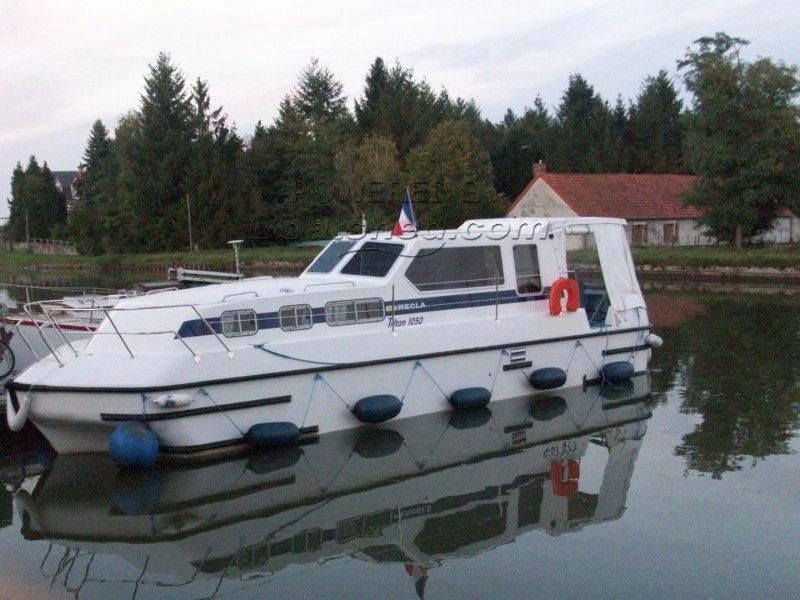 Boatshed Bourgogne is pleased to offer this very well presented canal and river cruiser for sale in Burgundy. This RECLA Triton 1050 One Owner, New Pictures To Be Soon Available has been personally photographed and viewed by Cathy BOUGUEREAU of Boatshed Bourgogne. Click here for contact details.